The story kicks off with an unusual query on what is it about birds’ singing that makes a person feel good. This childish wonderment will take student Magda on an adventurous journey chasing answers to her questions that she couldn’t get from mainstream resources. She quits her studies, deciding against learning by studying, but for “learning by traveling”. Her quest takes her first to Canada, where she brushes up on her English skills while working as an au pair. She meets Lena here, her alter ego, who becomes her companion throughout this story. The real breakthrough comes through meeting an extremely wealthy Chinese man, who reveals her the secret of success and fortune. He told her that everything he owned was not inherited, nor earned owing to his college degree, but instead it all felt of a magic tree. That secret tree is told to fulfill every wish, including giving answers. Oddly, she believes the guy and upgrades her quest to a mission to find that magic tree. In the start she broke the secrecy code and thus broke the magic spell, but not for long. The winds of fate bring to her another interesting character, who put her back on the track. He explains her all about the process of finding the magic tree that involves finding tools and taming dragons first. The tree is guarded by ferocious dragons that prevent anyone to discover it. Those dragons are embodiments of destructive emotions and attitudes such as fear, ignorance, delusion, anger, hatred, worry, jealousy, greed, attachment, doubt, prejudice, pride, revenge, impatience, sloth and so on. On her journey to find the magic tree, she is supposed to learn how to incapacitate and tame them with the use of appropriate tools (virtues) such as love, compassion, tolerance, forgiveness, understanding, faith, modesty, courage, imagination, perseverance, patience, generosity etc. Her incognito treasure map reveals her where to go next on her quest - Turkey. Through working as a show-girl in a night-club, among prostitutes and other characters that break most of the socially-imposed rules, she encounters her first demons - jealousy, prejudice and attachment. She learns how to triumph over them and in doing so come closer to finding the fortune tree. There in Istanbul, she witnesses the other side to the prostitutes and gets a peek into the chambers of a belly-dancer, who shares Scheherazade-like stories with her. She learns to tolerate and she learns to unlearn and relearn. A Muslim priest shows her the way forward. As follows, Magda goes on an Italy tour, engaged as an assistant to a magician. There she finds many new adventures, a romantic one as well, but not for long, because her determination to stand by her man gets her sacked, and on the way to another fiasco in an attempt to break into the fashion industry. All disheartened and broke she ends up back in the place she could no longer call her home, questioning the credibility of intuition. Croatia has nothing to offer her during those war-years, so she goes forward with her mission to find the magic tree in far-away places. Her next voyage is across Mediterranean Sea, aboard a cruise-liner working as a cocktail-waitress. Now, she knows trees don’t grow in seas, or on ships, so she’s there to look for tools instead. Truth be told, she is really after the money there. It turns out to be a wild goose chase, since she ends up empty-handed. Still, she pursues the chase even further, by swapping the seas. The Caribbean cruise doesn’t bring her the rewards she hoped, so she engages herself in a vindictive enterprise against her superiors, who mistreated her. Her new role of an avenger takes her into a spying escapade full of danger and thrill, where she tries to obtain evidences of toxic waste being illicitly dumped overboard into sea and sell it to the papers for big bucks. She gets defeated by demons of revenge, hatred, worry and doubt and finishes her sea adventures all crushed. It took another unusual character, in the role of a fortune teller, to set her back on the track. She gets fairly enlightened by insights into the work of the principle of reciprocity that helps her to sharpen up her tools of understanding, tolerance and forgiveness. That turned tables for our heroine and soon enough she’s back on her treasure hunt, this time in the Far East. In Japan she comes across all kinds of cultural differences. She finds out all about Buddhism, the extravaganza of kabuki and Noh Theatre, delicious tastes of local delicacies, holistic approach to tea making, mystical temples & shrines, idyllic Zen gardens, mysterious geishas and so on. She also makes friends with yakuza guys. Japan provides her with most of the material treasures she dreamed of, just to find out how frail and temporary it all is. Through working as a hostess in a karaoke lounge, many of her wishes come true, but it turns out they were not the ultimate ones. None of them could help her, when she finds herself behind the bars, due to working illegally. There in prison she gets further enlightened, by insights into true privileges in life and by mastering the use of tools such as modesty, humility, detachment, patience and understanding of karmic law. She finds freedom behind the bars. Following the camouflaged treasure map by her intuition, Magda heads to the enchanting India. She visits a spiritual guru there and stays in his ashram for a couple of months. There she finds many insights into nature of reality, along with the nature of dreams. Magda questions the role of her own religion, and finds answers in another one - Hinduism. Something extraordinary happens to her there. She experiences epiphany – God Himself reveals her something in her dream. There she also meets another great character, who gives her the key to the understanding of significance of tradition. England becomes her base for next few years. Magda makes her living there working again as a hostess in a karaoke club. She comes across theosophy and gets quite acquainted with it through volunteering in the theosophical library and meeting all sorts of mental challenges. Through the art of meditation she tames the impatience-dragon and comes to terms with the perception of time. Once again she encounters the dragonish prejudice, but armed with understanding and courage she successfully tames it. Magda takes a break from London and flies to Germany, where she discovers artistic side of herself, selling paintings for an art gallery. She also discovers her talent for sales, while selling stories rather than canvases. Balancing between art and trade brings new adventures and challenges in her life, from which she also learns how to find truth in lies. Falling in love takes her to another journey in faraway Hong Kong. Smuggling diamonds and precious artifacts with her new boyfriend gives her promises of better life, but some witchcraft propels her soon back, alone. The winds of fate carry her back to London, where she becomes a professional Poker player. Incredibly, she discovers the secret to winning in casinos every time! Oddly, playing poker strengthens her soul, by learning more about conquering dragons of fear, greed and vanity. She gets not only richer, but also wiser through playing her cards right. However, this new venture brings her some unexpected complications, which take her quest off the tracks with dragons in ambush. Love replaces wealth then, as she loses all the money, but wins a boyfriend. This love turns out to have an expiring date, so she moves again, but not too far. In Yorkshire she enrolls into a humanitarian program of a special college that takes people to Africa to work as volunteers. She stays there for six months learning about projects, but also about integrating into a group, as opposed to doing things on her own terms. There are many challenges to be met by developing a group spirit, along with dealing with pride as a dragon. Arriving to Angola, she starts a new intriguing adventure. Living with a tribe in a fishing village and working as a volunteer on a Child’s Aid project, she encounters the works of black magic, meeting interesting characters such as local shamans from whom she learns a lot about divination and healing methods. But the best lessons she gets from those she came to teach. She learns that the ultimate joy and wisdom don’t come through possessions but rather through her capacity to open, to love fully, and be free of attachments. She is challenged to combat the dragon of arrogance, but it gets down easily through the use of a proper tool. Magda goes through another extraordinary experience, as an apprentice to a sorcerer she gets initiated into being a disciple of God in an occult ceremony. The Holy Spirit comes down onto her hands and she becomes a healer. From then on all the villagers revere her as some sort of deity and come to her when in need for some treatment. She doesn’t take her role and the celebrity status seriously, because the dragon of doubt gets her again, disguised in the cloak of modesty. She meets her new love and through it faces another dragon in form of discrimination, particularly racism. After crossing the planet back and forth for about a decade, the heroine goes back to her roots to find an anchor, thus she finally settles in her homeland Croatia. Against all the odds, she gets a great job in the war-torn country. Climbing the corporate ladder from being a financial consultant to a director, she wins laurels at both, home and abroad. The interesting detail here is that the narrator at this point becomes a character in the story, helping Magda in the business arena, when she needs some masculine faculties to get ahead. Needless to say, she gets her fair share of obstacles, which made her even stronger, both as a leader and as a person. However, she learns it hard way what it means to be a woman in business and what it takes to reach the top – play hardball and sleep with the boss. Not willing to compromise her values and prostitute her soul, she deliberately drops the ball. But not before she finds out the alchemic formula, which turns failure into success. Here it becomes obvious to readers that Magda, her best friend Lena and the narrator Alen are actually all one and the same person (Magdalena), just different sides of heroine’s personality. Lena is what Magda secretly longs to be and her alter ego, having all the attributes that she wishes to acquire. Alen is her masculine self that after years of suppression comes to its full expression during the times of her career pursuit. At this point her interests turn back to developing her healing properties, so she gets her new initiation through Reiki. But it’s the mental healing that she focuses on. She continues to explore her horizons and expand her consciousness through ongoing self-improvement, thus shedding new light on many things she questioned when she was younger. Her old resentments towards the mainstream education, religion, tradition and the rest are now seen from another perspective and dismissed. One thing leads to another she discovers that her true mission in life has more to do with others than herself or the magic tree. Her true calling turns out to be enriching the world prior to finding her own riches. 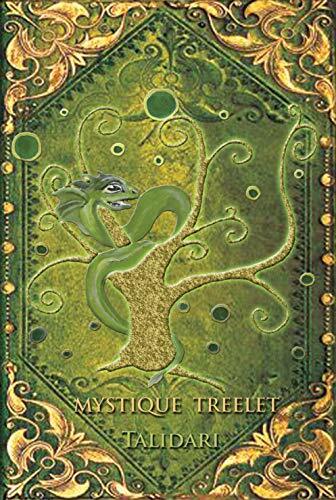 Writing an inspirational book becomes her ticket to the magic tree, as she finds her true calling. However, by the end she treasures the hunt rather than hunt the treasure. Bottom line, it's who she becomes as she overcomes the obstacles necessary to complete her quest that can give her long-lasting happiness, more than the object of her quest in itself, more than the magic tree. All throughout the story we find many references to the possible meaning of the bird’s singing that set her mission in motion, but the keynote remains to be the magic tree. She finds that the whole point is actually in the ethereal realm, in the fourth dimension, in the mere sense of wonderment and inspiration emanating from imagination and intuition.